Les Dames d’Escoffier, the same group that got me to St. Louis for their annual conference, had yet another assignment for me. Our local Les Dames chapter sponsors Community Design Center, a youth gardening program. Dames are often called upon to teach cooking classes to program participants and Tuesday was my day. I had limited time to pull ideas together, so a quick “menu” of granola and baked apples was planned. The granola recipe came from a class I’d taught many years before (again, to a youth gardening program, so I was confident it’d fly) and the baked apples were inspired by a cookbook my husband brought to the marriage. Strictly for Boys: A Cookbook for Boys 8 to 80 had been a gift to my husband from his mom when he was a small boy. Dog-eared, it also serves as a place for him to store any recipes he picks up from his mom, and it’s a kick to see it still used. My girls have scribbled “and Girls” just below the “for Boys” on the front cover and it’s a fun go-to book for simple brownie recipes and such. 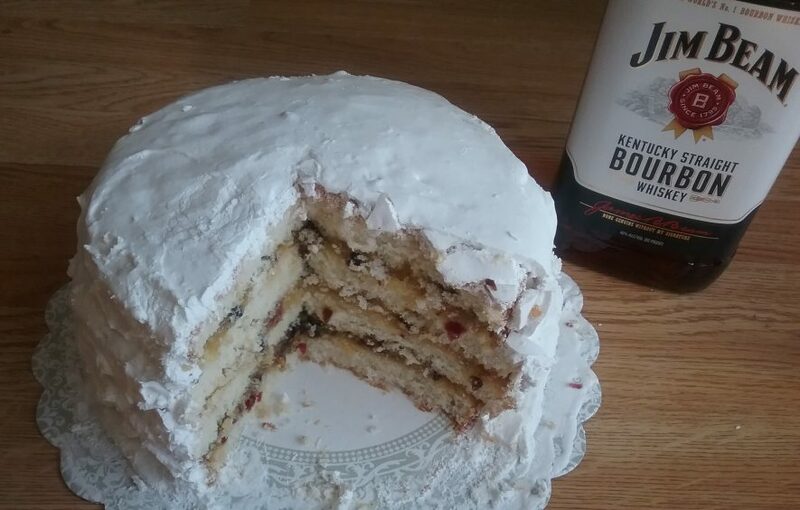 It was the first place I looked for a baked apple recipe. First step with the 12 high-schoolers was making a batch of brown sugar for the granola. I’m loathe to pay for what I could easily make on my own, so was glad to show these kids that a batch of brown sugar is as easy as thoroughly mixing 1 cup granulated sugar with 2 tablespoons molasses. (That’s how it’s done in the factory; why pay for that extra step?) 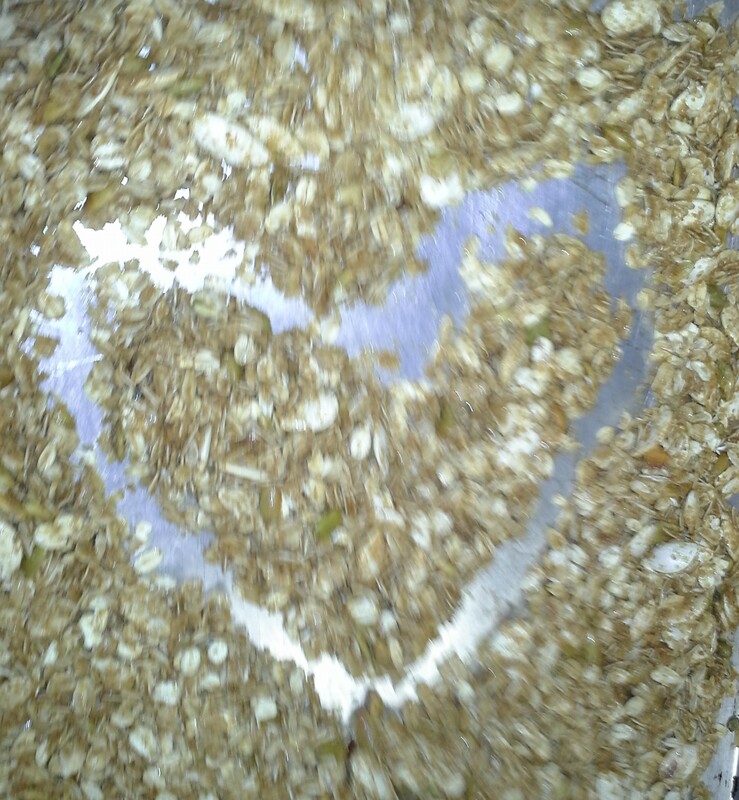 Granola ingredients were then thrown together and the students proved their creative mettle by etching a smile and a heart in their granola before baking. Next up was baked apples. I used the Strictly for Boys book as reference, but provided no recipe as I wanted the kids to feel comfortable making these “pies without a crust” (coined so by a student) without exact amounts. They enthusiastically cored their own apples, then filled them with cinnamon-sugar and a small slice of butter. After baking for half-an-hour at 375°F, the apples were ready. The fragrant baked fruit, oozing with buttery, cinnamon-sugar syrup, was gobbled up as quickly as the granola had been. These kids were amazing—cooperative, enthusiastic, entertaining, creative. (Even better, they did dishes without being asked.) And it was gratifying to see soon-to-be young adults enjoying (and inhaling) foods that were packed with good-for-you nutrients. I know I’ll soon be whipping these fall favorites up for my kids as well. Heat oven to 275°F. Grease baking sheet. 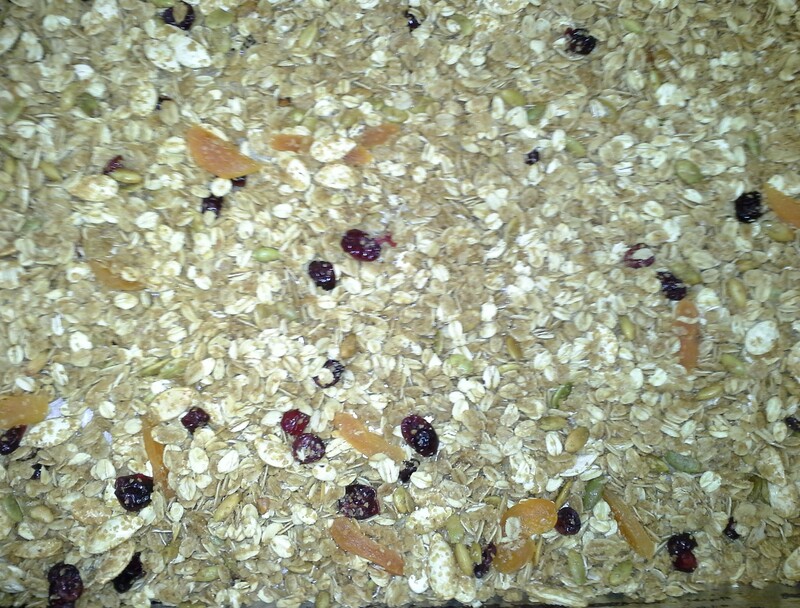 In large bowl, toss together oats, wheat germ, brown sugar, salt, and Extras except for dried fruit. In saucepan, bring maple syrup, oil, and water to a simmer. Remove from heat. Stir in vanilla. 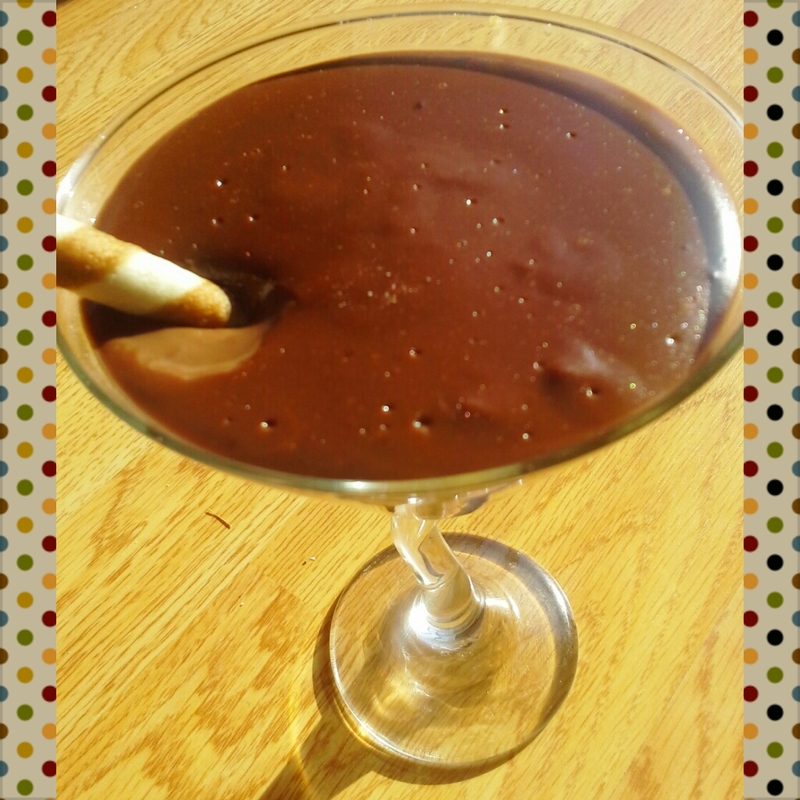 Pour liquid over oats mixture; stir to coat. Spread mixture evenly over baking sheet. 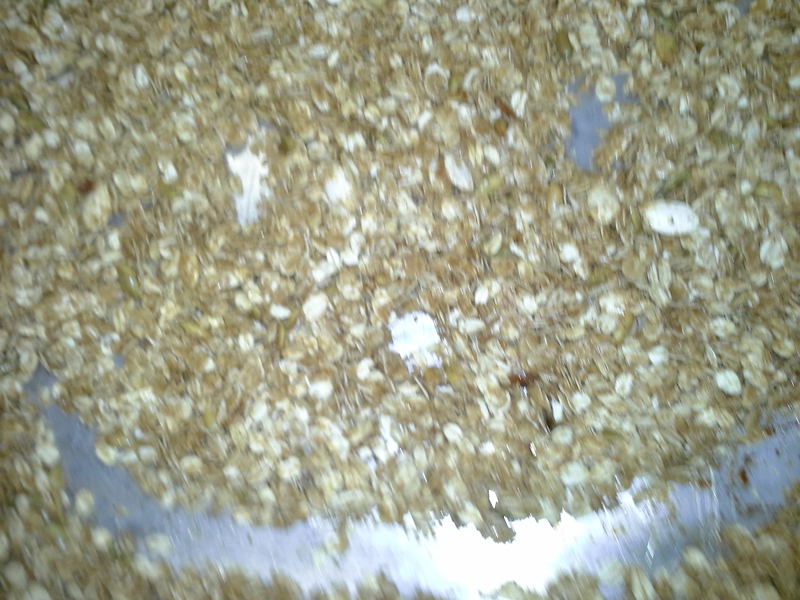 With fingers, squeeze oat mixture to form clumps. Bake 30 minutes. Stir in dried fruits, if using. Bake 15 minutes longer or until browned and fragrant. Makes about 3 cups.